New research could lead to ways to counteract diseases linked to X chromosomes in girls and women. Nearly every girl and woman on Earth carries two X chromosomes in almost every one of her cells — but one of them does (mostly) nothing. That’s because it’s been silenced, keeping most of its DNA locked up and unread like a book in a cage. What does it take to silence an X chromosome? More than scientists thought, apparently. Scientists believed they had figured out how cells do this, but a new piece of research from the University of Michigan Medical School shows the answer isn’t quite that clear. And the findings could help lead to new ways of fighting diseases linked to X chromosomes in girls and women — the kind that occur when the X chromosome that does get read has misprints and defects. In a new paper in the Proceedings of the National Academy of Sciences, U-M genetic researchers show that a molecule called Xist RNA is insufficient to silence the X chromosome. The gene for that molecule, Xist, has been seen as the key factor in silencing one of the two X chromosomes in every female cell. The findings come from the same team that recently showed how a fragment of genetic material made from reading Xist backward, called an antisense RNA, leads to the production of Xist RNA. What’s more, Kalantry says, in the future it may be possible to change the level of these other factors in cells and turn on the healthy, silenced copy of a gene that lies on the inactive X-chromosome. The Xist gene, short for X-inactive specific transcript, is found on each X chromosome. It doesn’t tell cells to produce a protein, like most genes do. Instead, it produces Xist RNA that physically coats the entire X-chromosome, and thereby is thought to seal most of it off from the rest of the cellular world. Now, the U-M group has shown that Xist has to have accomplices. Though they are close to identifying these accomplices, they do know that they reside in a very interesting place: the X chromosome that’s destined to get silenced. Although most genes on the inactive X chromosome are fully silenced, a handful of the genes on the inactive X are in fact active. It is this set of X-inactivation “escapees” that the research team focused on. Since the “escapee” genes are expressed from both the active and the inactive X chromosomes in females, they produce more gene product in female cells than in male cells, which only have a single X. The Kalantry lab’s study predicts that it’s this higher “dose” in females that triggers X-inactivation selectively in females; the lower dose in males is insufficient. That means that if researchers can determine exactly which factors cause X-inactivation to occur, they could find ways to affect the activity of genes on the X chromosomes — specifically, genes involved in certain diseases. A wide range of relatively rare diseases — as well as relatively common conditions such as autism, hemophilia and muscular dystrophy — are linked to problems with genes found on the X chromosome. Many of them have an impact on an individual’s thinking and memory capacity, and other aspects of cognition and intelligence. “In females, we could envision ‘reawakening’ a healthy copy of an X-linked gene on the inactive X chromosome, by modulating the dose of these so-called escapee genes and ameliorating the effects of the unhealthy copy,” Kalantry says. Unfortunately, this approach probably won’t help males with X-linked diseases, because they only have a single X chromosome in each cell and inactivating it would be harmful. But that’s exactly what made the new research possible: The team attempted to silence the sole X chromosome in male stem cells from mice by turning Xist on artificially. As it turns out, they could only silence the X-chromosome genes somewhat — because the male cells had no “twin sister” X chromosome to contribute the genes needed to finish the silencing job. When the researchers used female cells that had one X that was already inactivated — and therefore had the same number of active X chromosome as in males — they were still able to silence the active X when they artificially turned Xist on from that chromosome. The difference was that the female cells had higher levels of products made by “escapee” genes. Now, Kalantry says, the team is zeroing in on the specific X-inactivation escapee genes that first allow for Xist RNA to be expressed and then work with Xist to make silencing possible. In addition to Kalantry, the study’s authors are postdoctoral fellow and first author Srimonta Gayen, Ph.D., and two graduate students, Emily Maclary and Michael Hinten, of Kalantry’s lab team. The study was funded by the National Institutes of Health (GM07544, HD080280 and OD008646), the March of Dimes and the University of Michigan’s Endowment for the Basic Sciences and Reproductive Sciences Program. The U-M Sequencing Core Facility was used in the research. 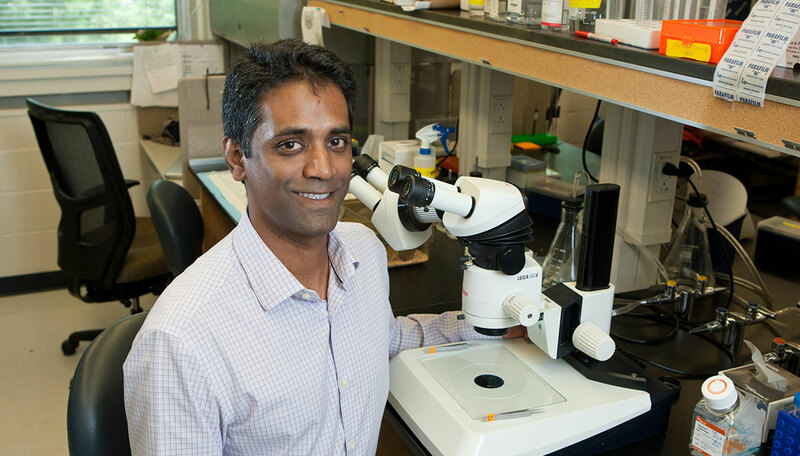 Top photo: Sundeep Kalantry, Ph.D.
How a U-M alumnus identified the first confirmed case of Hantavirus in the U.S.